Look back in anger. Photo: Enrique Rovira. W. Somerset Maugham’s penultimate play was not well received when it was first produced in the early 1930s. In fact it was met with a surprising degree of critical venom and didn’t run for long. It’s not that difficult to see why. For Services Rendered is a bitter, bristling play, and though the characters skip around in tennis whites and speak with the crispest of accents, there’s a bubble of anger at the centre of thing, a genuine sense of frustration. Set in the years of inter-war economic slump, the play concerns the continuing after-effects of the First World War on a middle class family. Sydney Ardsley, the only brother of three sisters, has been blinded in the trenches and now whiles away his days playing bridge and chess. In the early 1920s, Pinero’s expressionistic Enchanted Cottage explored how love and friendship could help heal such war-damaged men, but there’s no evidence of that here. Sydney’s unmarried sister Eva takes care of him but her dedication is driven by a sense of duty and her own capacity for sacrifice, not out of love, something of which they are both all too aware. His other sister, Ethel, made an impulsive wartime marriage to a caddish local farmer, Howard, and is living with the consequences (it’s implied, in one of the less attractive aspects of the play, that she’s paying the price for marrying outside her class) while the youngest sister, Lois, plots her escape from the stifling family home. Everything is tainted and tarnished; no family member is free of the stain. Only the Ardsley patriarch remains blithely unaware of all this pain and anguish: to his mind, there is nothing that can’t be cured with a stiffening of the upper lip, a nice cup of tea and, if needs be, a sedative. Maugham’s scorn for the short-sightedness of those in power is rather bluntly given voice through this man and his bluff optimism, his unwillingness to acknowledge what is happening under his own roof. The play is permeated with a sense of abandonment, an air of palpable anger about these men who gave so much for their country being left to sink once the war was over. This is most evident in the character of family friend Collie Stratton. Though a decorated naval officer, he is not well suited to life as a civilian, his business is failing and he faces ruin; when his requests for help are repeatedly spurned, he becomes increasingly desperate. In a small Kent town like theirs, where most of the good young men have been lost – including Eva’s fiancé – the choices the sisters are faced with are stark. When Lois, youth still on her side, makes a chilly decision to save herself, even though she risks creating a scandal and hurting others by her actions, Maugham – so often sensitive to the predicaments of women – doesn’t condemn her. The alternatives are certainly far from pleasant: a loveless marriage to a charmless man or a life of loneliness and misery. 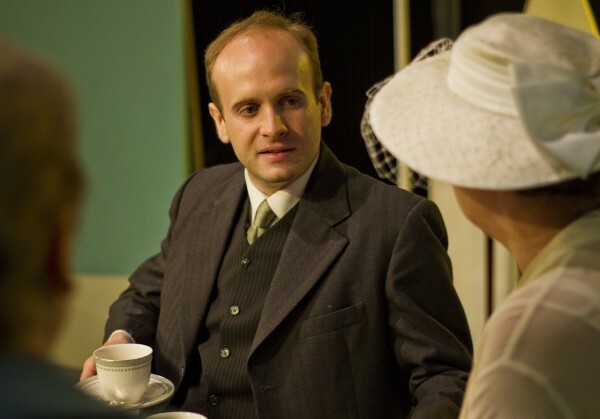 James Bounds’ production is elegant and measured, though it’s slightly too stately and doesn’t fully capitalise on the space’s capacity for intimacy; he successfully evokes a lost English summer, but seems less at ease with the play’s building hysteria. As Maugham ramps up the irony (and the melodrama), piling on illness and emotional breakdown, the production seems to lose confidence. The performances are, for the most part well-judged, if a little stiff in places. Eliza Hunt is agreeably grounded as the mother while Jonathan Peck’s justifiably disillusioned Sydney provides a necessary centre of calm amid the weeping and wailing.